Making it simple for you to have an effective, mobile-friendly website and to keep in touch with all your peeps! Webb Weavers Consulting provides services in support of a diverse range of small and medium sized businesses and non-profit organizations in Ventura County, Southern California and throughout the United States. By working closely and in collaboration with you, insight and understanding are gained about what you are striving to achieve, with the project at hand and for your business as a whole, thereby creating and providing the best solutions for your needs. An integral part of working with you is getting to know you and your business. This starts with a conversation; together we discuss your needs and goals, and how our services will best support them. Webb Weaver Debbie Gadbois is the web developer, designer and overall creative force behind all your projects as well as your personal marketing and support resource – no outsourcing here! When you choose Webb Weavers Consulting, you get both the personal touch of working directly with Debbie and the robust offerings of a large company. Webb Weavers Consulting is based in Ventura, California and was founded in 1999 by Debbie Gadbois. It was a business idea sparked from a love of graphic design and desire to delve into web design while providing services that are the best solution for her clients, with the personal support that is often lacking in do-it-yourself or “big box” providers, while also removing the stress that some folks associate with working with a web design company. With a M.A. in Museum Studies and a B.A. in Art History, Debbie’s experience in visual communication spans nearly twenty five years and includes graphic design, marketing, and webmaster positions in educational and non-profit organizations as well as companies in the private sector. The first seven years in business, Webb Weavers Consulting was her side hustle alongside a full-time job; clients were by referral only and projects included design for print as well as hand-coded custom designed websites. 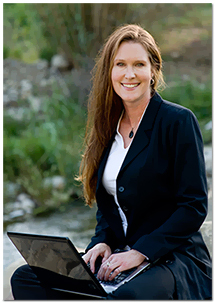 Debbie made the jump to full-time entrepreneur in 2006, shifted focus to web design and development, continuing to hand-code custom designed websites, adding website hosting as well as WebbMail Email Marketing services. By 2011 increased requests from clients who wanted to be able to update their websites themselves, prompted her exploration of WordPress design and development. She happily discovered she could continue to create custom designed websites for those who want them while also being able to offer pre-designed themes – a win win! This launched a full range of WordPress website design, packages and services, including care & maintenance plans and WordPress tutorial videos; and most recently Webb Weavers Websites. Would you like Webb Weavers Consulting’s support of your business’ website, email and online marketing? Please contact Debbie to schedule an introductory call.